One evening an old Cherokee told his grandson about a battle that goes on inside people. 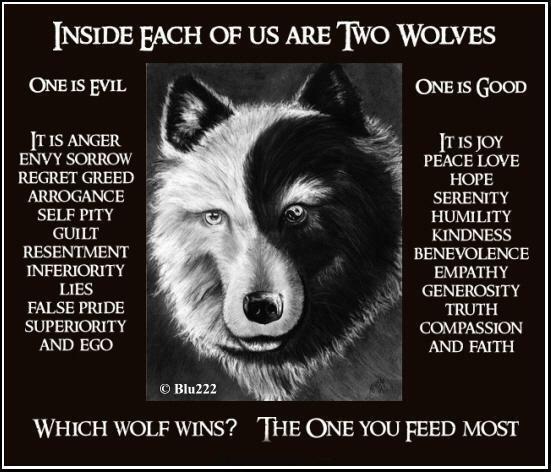 He said, "My son, the battle is between two wolves inside us all. "It is a terrible fight and it is between two wolves. One is evil - he is anger, envy, sorrow, regret, greed, arrogance, self-pity, guilt, resentment, inferiority, lies, false pride, superiority, and ego." He continued, "The other is good - he is joy, peace, love, hope, serenity, humility, kindness, benevolence, empathy, generosity, truth, compassion, and faith. The same fight is going on inside you - and inside every other person, too." The grandson thought about it for a minute and then asked his grandfather, "Which wolf will win?" The old Cherokee simply replied, "The one you feed". After a period of wolf and shifter dreams, they began to leave real-life residues. Dreams that I was up in a tree, upon waking I found a splinter embedded in my foot, and another I awoke with a long, red scratch upon my belly from these wolf dreamings. They came and went for awhile, the evidence apparent during the light of the day. Coming across this parable though, they stopped their regularity. The reason why these stopped so successionally was perhaps the fact that I understood now the meaning of; there were two wolves I was learning from and feeding my very being with... although sometimes I still do wonder which in fact I am, the good one or the bad when I get too caught up with the peculiarities of how the worlde does indeed work. I do have a silver bullet. Although he did not know of these affecting dreams it was given to me from my boyfriend. Mostly it stays on my altar for safe keeping, sometimes the silver is worn when my energy calls for a need for it... feeling safe to wear it upon my chest, occasionally the silver bullet I wear over my heart. Why this is so, one day surely I will Know.